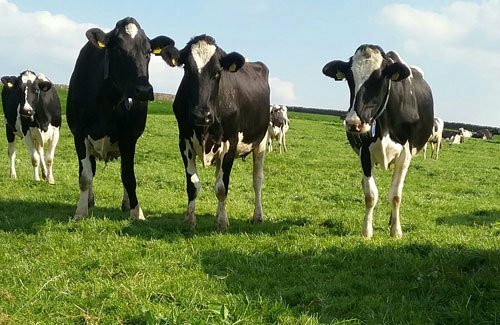 It is estimated that around 300,000 (15 percent) of dairy cows in the UK never go outside and more and more herds have only limited access to grazing. But, cows work hard for us, getting up early every day to produce milk and we think they deserve something in return. We consider grazing to be a fundamental expression of natural behaviour for dairy cows and want to secure them the freedom to roam in fields in the spring and summer months. People already tell us they want to be able to choose milk from cows in fields and we know that freedom for cows and other farm animals is important to them. We want to win a fair deal for farmers, cows and consumers. But right now, milk labels do not tell you how much time cows spend outdoors. You will see widespread use of images of cows in fields in supermarkets and on dairy packaging, to create a perception that all cows live the kind of life you would expect. Grass is a cheap, nutritious food for dairy cows and they turn it into healthy milk with high levels of Omega-3 and other healthy fats. Keeping cows indoors all year round is an expensive business, which means cows are under greater pressure to deliver high milk yields. We promote a farming system that is not reliant on the relentless pursuit of high yields and gives cows something more akin to the life that nature intended. Under Free Range Dairy standards farmers are permitted to house their cows in winter because they are often better off. The grass stops growing in winter and it gets wet and muddy in the fields. We also allow farmers to apply for a derogation to temporarily house their cows during the grazing season, if extreme weather events threaten to compromise the health and welfare of the herd.